Tina Irving lives at Dunnet Head with her partner of 30 years, Brian Sparks. 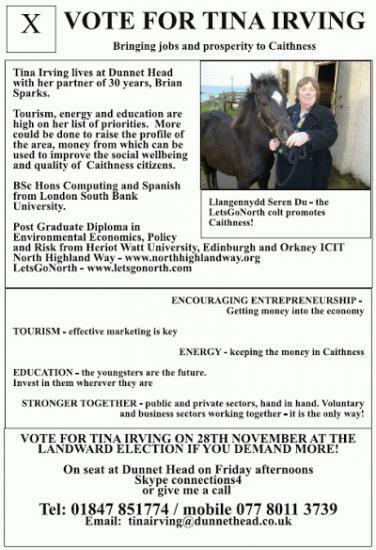 Tina is a retired project manager from financial services, and moved to Caithness in 2000. Having travelled the world, including the contentious and difficult Middle East, she now considers Caithness home and enjoys developing projects, the latest one being the North Highland Way. A graduate of London South Bank (LSBU) and Heriot Watt Universities, Tina has sat on many local committees and is very interested in renewable energy. Her post graduate studies included a dissertation on the effects of windfarms on tourism. She is an inveterate community person, and has assisted in the setting up of a business association in Spain, which involved bringing two warring factions together for the benefit of a small village in Andalucia. She brings those skills and experience to Caithness and has had input into many local projects and issues. A born organiser, Tina founded the Dunnet Head Educational Trust (2003) and the Caithness & Sutherland Walking Festival (2004) both of which are still going strong. The latest venture, the development of the North Highland Way, is proving rather a challenge as Tina is determined to bring private and public sector together for the benefit of the County. It worked with the walking festival, and it can work for this. The project will have an enormous economic impact on both Caithness and Sutherland, bringing jobs and business opportunities to the area. The aim is to formulate something akin to the South West Path. As Tina assisted with the writing of the Scottish Outdoor Access code and the Land Reform (Scotland) Act 2003, she is well placed to push the project forward. She is working in partnership with NHI, the Orkney Tourism Group (OTG) and the Durness Community Council on this. The project just yesterday gained the support of VisitScotland. Tina considers that education is also very important, and she has given many students from universities in Canada, the USA and Spain as well as LSBU opportunities to develop their skills. The younger generation are, after all, our future. The Trust was not only founded to raise the profile of Dunnet Head, but to help youngsters on their way in life. She is currently mentoring a young woman in business development, and also a student from LSBU with his IT skills. If elected, Tina would endeavour to sit on the committees which have the most impact on the County and support the main economic drivers for the area � tourism and renewable energy. These are the most important factors and have the ability to bring jobs, social and economic development to the area as Dounreay winds down.